What a pleasure to catch up with Bill Leibold over the past few weeks. 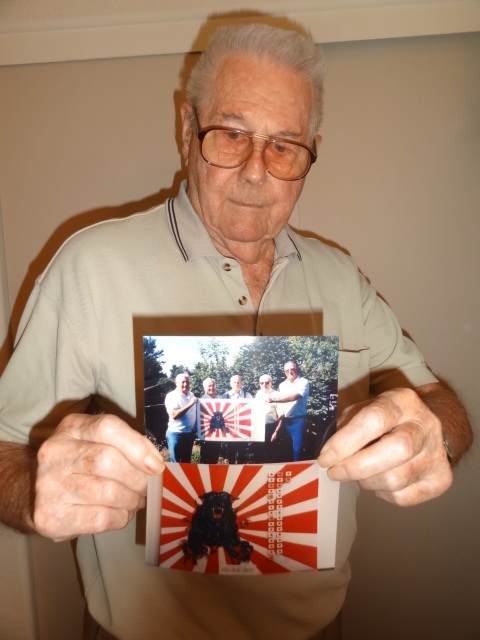 At 91, he is the last survivor of the USS Tang, a submarine that went down after Pearl Harbor. Some of you know Bill from Palomar. He and his wife Grace built the “Ship House” out on Birch Hill. (See the 2004 message below from a post telling a little of their story.) Ken and Michele Easton are “manning the ship” now. You’ll also find below, a 2009 post from Ken about one of the several books written about the Tang. Bill and Grace were high school sweethearts. Bill was on a ship, serving his Country at Pearl Harbor during the attack. A year later he was on the most decorated submarine during that time, the USS Tang with 87 officers and men. She sank approximately at 0230, 25 October 1944 after being struck in the stern by her last torpedo, that had run erratically on the surface, port side. Tang was on the surface, attacking a Japanese convoy in the Formosa Straits and sank in 180 feet. Grace was notified in early 1945 that Bill’s submarine was overdue & presumed lost (the original notice is in his album). For 15 long months Grace refused to believe the news. Some of the wives, understandably, went on with their lives, and remarried. But not Grace, she waited for Bill. After the war was over, Bill was found in a Japanese Internment Camp. He was one of nine men who survived that fateful night, all night, in the water and then endured the treatment of imprisonment. Because they were submariners, they were looked down upon by the Japanese, so they were given only half rations. Japs declared Tang men were criminals, not POW’s, and subsequently placed in solitary confinement at Ofuna (not a POW Facility). In mid 1945, Tang men and others were transferred to Omori, a Jap army run POW facility, again placed in “Group solitary confinement”, ultimately put on work details and provided one half ration of food, that POW’s received. Bill came back to America weighing less than 100 pounds. After recuperating, he then continued to serve his country and retired from the Navy as a Commander. Of the nine men that returned, seven were married. After the war was over and the men returned, four of the wives had remarried, which was understandable, with the telegram they had received. 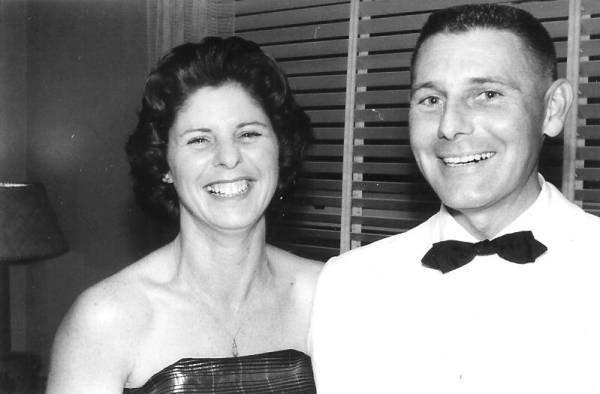 Bill has always been so thankful for his wife Grace, that she waited for him, and cared for him as he gained his health, and went on to command two ships, a shore base, and other activities with the Navy. They raised a family of two sons and a daughter, who all want copies of a wonderful scrapbook their father has made, and added to, over the years. Bill has moved recently. His home in “shipshape”, sold in about a week. I got to see the most recent additions to his scrapbook and he allowed me to take a few photos to share with you. The ship’s flag went down with the Tang. Someone else had a drawing of what they thought the flag might look like. It was not correct. So, at a Tang reunion a few years ago, Bill drew up a sketch and circulated it with the other survivors. He revised the sketch several times, based on their input, and then had a company in Escondido make two flags. One is on display at the submarine base in New London, CT. His youngest son has the other flag. 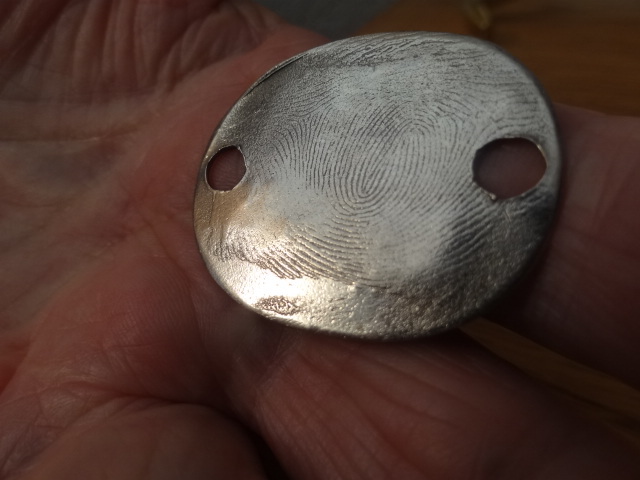 Bill’s dog tags made in 1941 are very unique with his fingerprint on them. With the war starting, it became too much of a task to make these tags, so very few were made and there are very few left. 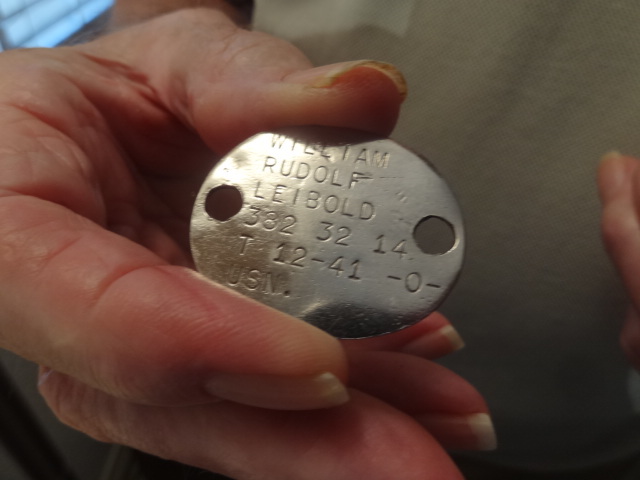 We only live in the land of the free, because of the brave, and because of women and men like Bill Leibold. Bill and Grace were high school sweethearts. Bill was serving his Country at Pearl Harbor and was serving on a ship at Pearl Harbor during Dec. 7th attack. A year later he was on the most decorated submarine during that time, the USS Tang with 87 officers and men. She sank approximately at 0230, 25 October 1944 after being struck in the stern by her last torpedo, that had run erratically on the surface, port side. Tang was on the surface, attacking a Japanese convoy in the Formosa Straits and sank in 180 feet. Grace received that dreaded telegram that told her Bill’s ship was lost at sea and he was presumed dead. For 15 long months she refused to believe the news. Some of the wives understandably went on with their lives and remarried. But not Grace, she waited for Bill. After the war was over, Bill was found in a Japanese Internment Camp. He was one of nine men who survived that fateful night, all night, in the water and then endured the treatment of imprisonment. Because they were submariners, they were looked down upon by the Japanese, so they were given only half rations. Bill came back to America weighing less than 100 pounds. After recuperating, he then continued to serve his country and retired from the Navy as a Commander. They have fond memories of building their three story “Ship House” on Palomar in the mid 1970’s and enjoyed being full timers for over twenty years. However, because of Grace’s health, they realized the need for a single story home and be closer to the doctors. Bill and Grace are missed on the Mountain, and would welcome notes from their friends. Love this, Bonnie. Thanks for being the knitting needles that faithfully, steadily gathers all these stories, tidbits and classifieds, knitting them together and in the process, joining all of us who love this mountain together – even with those we do not know. God bless you.